Dave Marshall-George examines the different ways humidifiers can be used in data centres to provide low-cost evaporative cooling. The use of evaporative cooling in data centre environmental control strategies is now relatively commonplace. The nature of evaporative cooling perfectly suits the requirements of a data centre’s climatic operating window. 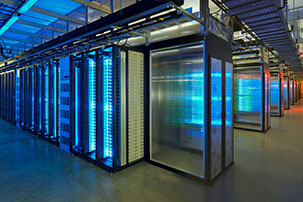 Unlike a regular office temperature of around 23°C, a data centre’s upper temperature condition can be as high as 28°C. As the UK’s temperature rarely rises above this level, many data centre cooling systems simply use the outdoor air rather than mechanical chillers to cool their data halls. During the warmer months, when the outdoor air becomes too hot to successfully lower the indoor temperature to 28°C or less, evaporative cooling can be used to give an additional boost to an air handling unit’s cooling capacity. A kilo of cold water, when evaporated into the air, provides 0.68kW of adiabatic cooling. A cold water humidifier can supply around 1,000kg of moisture while operating on less than 1kW of electricity, so they offer great potential for low energy, high capacity cooling. Depending on the condition of the outdoor air, evaporative cooling from cold water humidifiers can offer a temperature reduction of up to 12°C. More and more air handling units are being developed with an evaporative cooling element to take advantage of this low cost, low energy form of temperature control. Two main strategies have emerged for using cold water humidifiers to provide evaporative cooling in AHUs for data centres; direct and indirect. Direct evaporative cooling uses the humidifier to spray or evaporate water into the filtered, incoming air stream. This strategy is used to boost the cooling effect of “free air cooling” systems, whereby a high volume of outdoor air is supplied to the data halls and an equivalent amount of warm air exhausted. Direct evaporative cooling is ideal for use in dry climates, where the dry outdoor air offers the greatest potential for absorbing moisture from the humidifier, and therefore providing cooling to the incoming fresh air. For a climate such as the UK, direct evaporative cooling in a free air cooled data centre would only be needed during the summer months. Typically, the outdoor atmosphere during this period would, therefore, be sufficiently dry to make evaporative cooling effective, thus reducing the incoming air temperature into the required data hall condition of less than 28°C. A consideration for employing this type of cooling strategy is the level of criticality placed on the introduction of outside air to the indoor environment. For critical data centre operations, a cooling system that is dependent on the introduction of outdoor air may not be acceptable, given the potential risk from external pollutants, such as a nearby fire. An alternative form of evaporative cooling that avoids this risk is indirect evaporative cooling. This strategy uses a heat exchanger, such as a crossflow or thermal wheel, to transfer the thermal energy from an external airstream to a circulating internal airstream. The outdoor air is drawn into the AHU, run through the heat recovery (HR) unit before being exhausted. Warm air is extracted from the data halls, run through the HR and its temperature reduced by the cooler outdoor airstream, without mixing directly with it. This cooled air is then recirculated back into the data halls to reduce the internal temperature. The effectiveness of this strategy obviously depends on the temperature of the outdoor air being below the data hall’s target condition. To maximise the potential cooling from this system and expand its use into times when the outdoor temperature is too high, a cold water humidifier can be applied to the external airstream prior to the HR system. This reduces its temperature and increases the cooling capacity of the system. In this type of indirect cooling strategy, a significant benefit of using air humidifiers to reduce the temperature of the external airstream, is that it means the system falls under Part 3 of the UK’s Legionella regulations, ACOP L8. Other indirect cooling systems, which spray cold water directly on to the heat exchanger, can be categorised similarly to cooling towers and fall under HSG274 Part 1. This makes them notifiable to local authorities, increases the responsibilities of the building operator and makes the legal and administrative obligations more onerous than an air humidifier classified under Part 3. 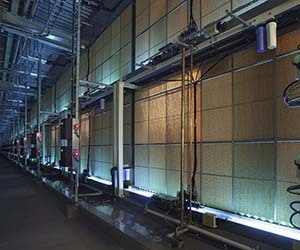 There is a third type of evaporative cooling strategy, but one that is as yet, not commonly employed by UK data centre designers. Indirect exhaust air evaporative cooling sees a cold water humidifier cooling the warm air that is extracted from the indoor atmosphere. This cooled exhaust air is then fed through an HR unit before being ejected outside. A fresh air supply brings air in from outside and runs it through the HR unit, where it is cooled by a few degrees by the cooler exhaust airstream. This incoming fresh air can then be introduced to the data halls or cooled further mechanically, if required, before being supplied to the room. This strategy can reduce the load on mechanical chillers, thus lowering a building’s overall cooling costs. It is also interesting, as it can be useful irrespective of the outdoor climate. Both the direct and indirect cooling strategies previously outlined rely somewhat on certain outdoor conditions being available, with regards humidity and temperature. An exhaust air indirect evaporative cooling strategy uses the air being returned from the indoor environment, which is mostly consistent regardless of the ambient outdoor climate. We often see this type of cooling strategy used in hot and humid regions across Asia, as well as parts of Europe, particularly Germany, where the drive to reduce a building’s energy consumption is paramount. Wherever the data centre or whatever AHU cooling strategy is being employed, there is nearly always an evaporative cooling method that can enhance performance or reduce energy consumption. The data centre industry’s insatiable need for low cost, high capacity cooling has driven effective collaboration between data centre designers, AHU design teams and humidifier manufacturers to produce more and more innovative solutions. Long may it continue.